Home > Heart Conditions > What is Heart Failure? Heart failure is a serious heart condition but it doesn’t mean that your heart stops completely, as it does in a heart attack. The heart carries on working but not very efficiently. It is like an engine that is getting worn out – it fails to pump blood round the body in the same way that it used to. People can live with heart failure for months, even years. It can be a disabling health problem but various treatments are available to improve symptoms and make the heart work more normally. The heart is a muscular pump that consists of four separate chambers. 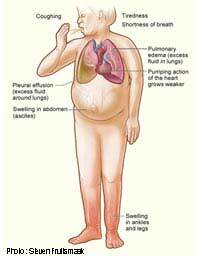 Heart failure can affect different parts of the muscle; one side may be affected more than the other side. In people who have right-sided heart failure, the right ventricle is the most severely affected. This is the part of the heart responsible for pumping freshly oxygenated blood out into the body. As the right ventricle fails, blood isn’t pumped out as strongly, and blood doesn’t return to the heart properly either. The capillaries, the small blood vessels in the arms and legs, become distended and circulation becomes sluggish. Fluid then builds up in the tissues, causing swelling in the arms and legs, swelling in the abdomen and fluid in the lungs. This causes some breathlessness and coughing, which is worse when lying down. Left sided heart failure means that the left ventricle is failing. This is responsible for pumping blood out to the lungs to collect oxygen. When this becomes inefficient, the first and most severe symptom is breathlessness, which can occur even when the person affected is just resting. Any sort of exertion is impossible. Heart failure has many causes, including a heart attack, high blood pressure, a problem with one of the valves of the heart, and any infection that attacks the heart muscle. It usually occurs in people over 65 and is less common in younger people. Some lifestyle factors increase the risk of heart failure, including smoking, being obese and leading a very sedentary lifestyle. How is Heart Failure Diagnosed and Treated? If the symptoms suggest heart failure, the usual first step to diagnosis is to have an echocardiogram, which uses ultrasound to investigate how well the heart is pumping blood. This can identify which part of the heart is affected, and can help doctors decide on the most effective treatment. An electrocardiogram – ECG – can also be used to detect any problems in heart rhythm. Blood tests for specific cardiac markers that rise in cases of heart failure may also be done. The main treatment for chronic heart failure involves taking different kinds of cardiac drugs. The main drugs are from the family of ACE inhibitors, which have been shown in large trials to reduce symptoms and extend the life of someone with serious heart failure. Diuretics are also often used to help the body expel the excess fluid that builds up in the tissues and one the lungs. Beta blockers can also help. In its early stages, heart failure can also be treated by making lifestyle changes. People are advised to cut down on the amount of salt they take in, and sometimes may have to restrict the amounts of fluid they drink. Although some people think they need to rest to stop their heart wearing out even more, the opposite is true. Moderate and regular exercise can improve the condition of the heart muscle and can reduce symptoms quite dramatically. Stable and Unstable Angina: What's the Difference? Why is High Blood Pressure Bad for the Heart? As previously stated by others, the functions of the left and right ventricle have been reversed in this article. there are some mistakes in this article. left ventricle not pumps blood into lungs,but it pumps freshly oxygenated blood out to body through aorta. similarly, right ventricle pumps blood out to the lungs for oxygenation,through pulmonary artery.